The territory of Levoča, the most important centre of the medieval Spiš, was inhabited as early as the Neolithic Age. One pre-urban settlement, called Kacvinkel, was situated on the site of the present-day Košice Gate, while another one incorporating the Romanesque Church of St Nicholas lay on the left side of the road from Levoča to Spišská Nová Ves in the location of a military exercise area. Levoča is first mentioned as Leucha in 1249 and shortly after in 1271 it became the capital of the Association of Spiš Saxons. In addition to the favourable position of the town, it enjoyed various rights and privileges which supported the trading and independence of burghers and were instrumental in the town’s economic development, especially the right to store goods, granted in 1321. Levoča was declared a free royal town in 1323 and later it gained its economic and social prosperity at the end of the 14th and 15th centuries. The 14th-century three-nave hall parish Church of St Jacob predominated over the large market square, with its regular blocks of buildings. 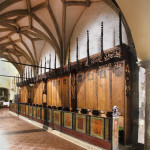 The Chapel of St. George was annexed to its northern nave in 1392. The library, built in 1520-1540 as one of the first Renaissance buildings in the town, was made accessible from the chapel. The late Gothic main altar of the Virgin Mary and St Jacob the Apostle was carved by Master Pavol of Levoča. It is probably the highest late Gothic altar in the world. The other altars in the church’s interior also originated in Master Pavol´s workshop. Another dominant feature of Levoča main square is the two-storey Town Hall which dates from the 15th century. It was renovated and enlarged in the Renaissance style after a fire in 1559. The entrance portal was preserved during the reconstruction completed in 1615 and arcades and archways were built on the ground floor and the first floor. The facade is decorated with symbols of civic virtues. The Town Hall is now connected with the prismatoidal Renaissance belfry from the half of the 17th century. The independent building standing on the square is the Trading House (Waghaus), a former municipal scales and exchange office which dates from the end of the 16th century and was rebuilt at the end of the 19th century. Merchants had to declare and store their goods in the Waghaus on the basis of the right of storage. There was also a seat of a supervisor watching over the precision of measures and scales. Today the building serves as the municipal office. The newest building in the southern part of the square is the Classicist Evangelical Church, which was built on the site of an older wooden church in 1825-1837. The unique ‘cage of shame’ was installed not far from here in the first half of the 20th century. It originally stood in place of the Evangelical Church and in the 16th and 17th centuries was used for the public humiliation of petty criminals. The town was protected by fortifications that were very progressive in those times and wisely benefited from suitable terrain configuration. The oldest bastions date back to the 14th century. About 80 per cent of the town walls have been preserved with 16 bastions from the 17th century. Three town gates, called the Košická, Menhardská and Poľská gates, have survived up to the present day. In the neighbourhood of Poľská gate stands the medieval Franciscan Church of St Ladislav, later dedicated to the Virgin Mary, and the Minorite Monastery. During the Reformation Levoča was oriented to the Augsburg religion and gained religious freedom. 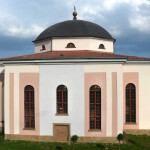 In the following period of the Counter Reformation Jesuits came into the town and rebuilt the Minorite Monastery at Košická Gate and the Church of the Holy Spirit in the Baroque style. But the importance of trade, the main economic force of Levoča, gradually declined. Slovak national awareness increased during the half of the 19th century thanks to the arrival of Slovak students of Ludovit Stur. Lectures were taught in Slovak and Czech. One of the most remarkable public buildings from the 19th century is the Town Theatre, which now houses a congress and theatre hall. The Classicist Župný dom (County House) was built on the northern side of the square between 1806 and 1826. It was the seat of the former Spiš County until 1922. The construction of the Košice-Bohumín railway line in 1873, which bypassed the city, diminished Levoča´s importance, but it also contributed to the preservation of its exceptional buildings. In 1950 the town´s historic core with its typical town-planning structure and well preserved architecture, including town walls, was declared a Town Conservation Reservation. In 2009 the area Spiš Castle and surrounding monuments, already inscribed in the UNESCO World Heritage List, was expanded to include the historical town of Levoča.